Rather than play cat-and-mouse for multiple seasons with no end in sight, BBC America’s Prey resolves itself in just three weeks before moving on to another entirely different catch. In this case, that makes it an extended “procedural” that’s more than run of the mill. 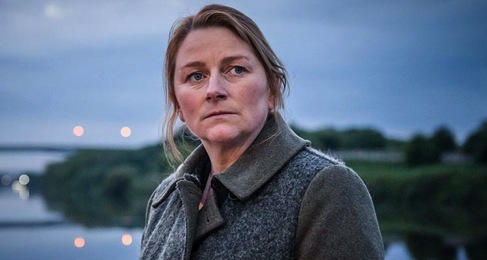 At its center is Detective Sergeant Susan Reinhardt (Rosie Cavaliero), a plump, snack-loving divorcee who puts two and two together and tries to make it all add up. An ongoing onslaught of new programming, whether on TV or from increasingly prolific streaming services, makes it nigh unto impossible to watch each and every episode made available for review. So I’ve made do, in this instance, with watching the three-hour first case, which concludes on March 10th. These episodes hold interest without being riveting. But Cavaliero is compelling as a dogged, under pressure gumshoe who in this case might remind some seasoned TV watchers of Lt. Philip Gerard from The Fugitive. The wrongly accused escapee, who takes flight from a flipped-over paddy wagon rather than a derailed train, is Detective Constable Marcus Farrow (John Simm). Separated from his wife but trying to reconcile with her, he remains a doting father of their two sons. So imagine his horror when only his older son survives a home invasion shortly after an angry Farrow has punched a hole in a kitchen wall after learning his wife is seeing another man. Reinhardt is quick -- too quick, really -- to deduce that Farrow did it. His escape triggers a manhunt and a series of other narrow escapes while Farrow looks for the real killer or killers. It’s all tied to a decomposing dead body discovered earlier in the game. But what are the connections and who’s covering them up? Simm is rock-solid from the start as Dr. Richard Kimble, er, detective Marcus Farrow. Cavaliero comes to the fore later in this twisting, turning whodunit, which is spiked with enough chase scenes to merit BBC America’s “high-octane thriller” billing. In the end, though, viewers aren’t likely to be blown away by either the intrigue or the action. Some of the puzzle pieces don’t fit as snugly as they should in Prey, which can be a bit all over the place even when Marcus isn’t running to and fro. But at least you’ll get a resolution in return for a relatively short investment. Then it’s on to another case with all new principals save for Cavaliero’s Reinhardt. She’s the lone constant on both sides of the law, giving this series a character who still seems worth getting to know better.